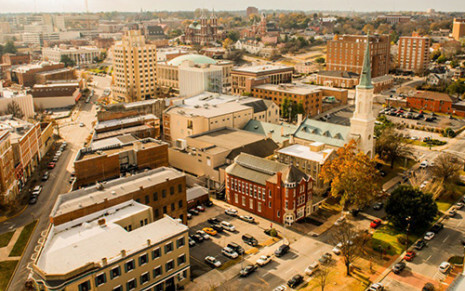 The Macon Marriott City Center hotel is an ideal downtown hotel with convenient access to all of Macon's historic sites, museum district, art galleries, and trendy night spots. Connected to the Macon Centreplex Convention Center, the Macon Marriott offers 5,000 square feet of meeting space. The hotel features 220 guestrooms and suites for guests attending conferences, sporting events or concerts in the Macon area. After a day of conferences, meetings or fun sightseeing unwind and enjoy our luxurious bedding, wireless Internet, 37-inch flat-panel HDTV, indoor pool and a “Hydrotherapy” pool or visit our fitness center for an invigorating workout. The warm and inviting environment of this Macon accommodation makes it the best choice for business travel, weekend getaways or family vacations. Highlights: New luxury hotel in Macon with amenities that ensure a comfortable and productive stay. Equipped with high-speed Internet access and a spacious work desk for the business traveler. Well appointed rooms and suites perfect for business travelers and families. Plug in Panel connects laptop, MP3 player, digital camera & video game player to big screen LCD HDTV. Luxurious bedding with thicker mattresses and fluffier pillows. Concierge Level includes complimentary Breakfast and Evening Snacks Monday through Friday. State-of-the-art meeting facilities with on-site audio/visual service and business center. Connected to the Macon Centreplex, offering an additional 120,000 sq. ft. of meeting space in the Macon Coliseum and Edgar H. Wilson Convention Centre.